You’re vacationing on the island of Key West! More than likely because you’re looking for a tropical getaway that includes sunshine and a light ocean breeze. It’s time to explore the many beautiful outdoor attractions and have some adventures you’ll never forget. This quaint island paradise has an abundance of outdoor activities, from the laid back and relaxed to the take-your-breath-away thrilling. Read on for some of the top outdoor adventures in Key West. A secluded oasis in the middle of the Gulf of Mexico, this collection of tiny islands is just the thing for those who love nature, wildlife and history. For an experience that will delight the entire family, hop on the Yankee Freedom III, the official ferry of the Dry Tortugas. Your ride on this expansive catamaran will not only be relaxed and scenic, it will provide you with a complimentary breakfast and lunch, snorkel gear and fascinating facts about the Dry Tortugas and Fort Jefferson. But that’s just the beginning of what you’ll consider to be an unforgettable day in paradise. 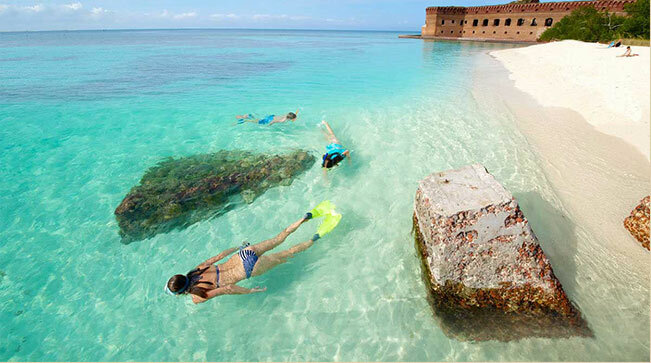 Once you arrive, you’ll step off the boat onto a beautiful sandy beach and see the massive Civil War fortress before you, Fort Jefferson. With its 16 million bricks and centuries of history, the fort provides an incredible adventure through America’s heritage. Take a guided tour or wander about on your own; see the cells where inmates were held, including that of Samuel Mudd, the fort’s most infamous prisoner. Then enjoy the natural beauty of the island, snorkel in the warm and shallow waters, grab a kayak, walk along the peaceful shore and soak up some rays on the beach. Keep a watchful eye to the sky for some of the more than 300 bird species that inhabit the area. Key West is home to the only living barrier reef in the continental United States. Discover the majesty and beauty of our underwater world with a snorkeling trip. Many companies across the island offer excursions that depart in the morning and afternoon, and some even offer combos that include sunset tours, music and more. The catamarans are large and comfortable, have fresh water showers and a captain and crew that are not only locals, but are knowledgeable in the best way to snorkel the reef. You’ll be provided with top-of-the-line snorkel gear, a float if you wish and tips on what you’ll see when you’re snorkeling. You’ll be amazed at the variety of colorful fish, coral and marine species right in front of you. Fort Zachary Taylor State Park is considered by many to be home to the most beautiful beach in Key West. Whether you want to swim in the crystal waters, snorkel the reef or go fishing, there’s a ton of fun to be had at this historic park. Check out the Civil War fort and take a tour; you can see the cannons and learn about the fascinating past of this ancient fortress. There are also lovely shaded trails that wind around the shore, bike paths for an afternoon of exercise and intriguing birds and wildlife. Bring a picnic or grab some grub at the Cayo Hueso Café, which is open daily from 10am to 5pm. The only frost-free botanical garden in the continental United States, this natural treasure is home to various endangered and threatened flora and fauna. Take a tour on the meandering trails that wind through native hammock, fresh water wetlands, butterfly gardens and beautiful flowers. Find the hidden pond and look for the resident white crowned pigeon and bald eagle for a truly unique experience. There’s a gorgeous courtyard where you can sit, enjoy the tranquility and gaze at the waterfall wall of tropical plants. For an exhilarating experience you’ll never forget, embark on a parasailing adventure. Many Key West watersport companies offer both tandem and solo flights, wet or dry take offs and landings and breathtaking views of Key West as you soar above the water. The parasailing team takes you out to sea and offers you a chance to see Key West as you never have before. Parasailing trips are offered frequently throughout the day. All you need are your sunscreen, towel and sense of adventure!